The weather has been outstanding these last couple of weeks. It seems, though, that the annual June rains have hit the streets today. But luckily I had the chance, time and temps high enough to try out a recipe from kitchen guru Camilla’s new selection of herb recipes that was published this Saturday as a special section of Politiken, a Danish newspaper. Safe to say, there are enough recipes and ideas to keep me busy for a little while. But first up was a really refreshing afternoon drink, good in the heat but I think I’ll make it again this weekend even if the weather gods have decided to bless some one else with Summer sun. May can pretty much be summed in one word for me. Rhubarb! I find May a little gastronomically challenging – Spring is here and so is the promise of all the great new season’s vegetables. Yet I’m always a little ahead – in this little corner of life, anyways – , and that leaves me empty handed after grocery shopping. The spring cabbage hadn’t quite hit the marked, the asparagus hadn’t peeped up from their winter hiding yet and so it goes on. Until the rhubarbs announces the new season, that is. And not only are they Spring time messengers, I absolutely love them! Rhubarbs are just one of those things I can keep eating, cooking and coming up with new things to do with. I had better get a move on, since the closing date for entries are approaching rather quickly. I mentioned a while back that I had something cooking for this year’s A Taste of Yellow, the cancer awareness food blog event organized by vinosandfoodies. Right up till last Sunday I knew what I wanted my entry to be. I was well organized and ready, had even done the photography. All ready except the writing. Then we celebrated baby-J’s first birthday and the plans changed. In stead of the saffron infused breads, known in Scandinavia as lusekatter, they are certainly yellow (! ), I opted for the lemon fool layer cake we made for the birthday. It was yellow, we all loved it and we’ll make it again. But just as an added Taste of Yellow bonus, I’ve included the photos of the lusekatter as well. This Saturday I woke up with a sudden urge for French cookies… This was a rather strange urge, at a rather strange hour I must admit. But it was persistent. So I caved and thought what better way to spend Saturday morning – not just morning, but MORNING, thanks to a little almost one-year old early riser – than trying out Dorie’s new issue Baking – from my home to yours, and realizing one of my blogging plans: posting review’ish posts about my ever increasing cookbook collection. The first result was these rather nice looking, if I say so myself, no-frill Madeleines. I was one of the lucky winners of the great blog event Menu for Hope. The prize was a signed copy of Baking, a book that really has caught on fire in the blogging community. There’s even a weekly foodie event where eager bloggers try out recipes. And there are loads to choose from. Dorie hasn’t exactly been holding back as there are more than 500 pages of recipes and glossy pictures. Spring was supposed to arrive last weekend as Easter week came marching in. Alas, it didn’t. The week started out nicely with sunshine and temps hovering around 10-15 degrees, and I had my mind set on things crunchy, lemony and Spring like. It ended in the candle-lit-brunch-with heavy-rains-and-the-like department. Fortunately, there are remedies for these situations. In this particular moment we turned to cinnamon, butter and moscovado. L had an all-day baking workshop with kitchen guru Camilla a couple of weeks ago, so it only seemed natural to try out one of the things they didn’t get around making do a repeat of one of the stars of the day: cinnamon bread packed with cardamom and buttery-sugar filling. Cinnamon rolls are a breakfast stable at many a Danish breakfast table on weekends, as it is in other parts of the gastronomic world. (Check out Keiko’s flawless cinnabon look-a-likes here). In stead of the normal roll-shape, this is a rather different take where you change a little and end up with a rather different result. The bread/loaf – call it what you like – is great for serving as the sweet part of brunch. We also used it alongside a traditional saffron infused bread (more on that later on when A Taste of Yellow approaches) for an afternoon treat. Dissolve the yeast in the luke warm milk; add the rest and knead thoroughly. Hold back on the flour, you might not need it all – keep the dough on the sticky side. Let the dough rest until doubled. On a floured surface or silipat roll out the dough into a square shape that will fit the bread pan when rolled up (approx. 20cm will fit this portion.) Spread the filling evenly and roll the dough. Make sure the ends aren’t opon. Otherwise all the filling will ooze out during baking. Place the dough in a buttered/non-stick/lined baking form and cover with egg wash. Let it rise until wobbly and bake at 200 C for 25-30 minutes. Yes, I know. It sounds like a funny combination, doesn’t it? The thing is, that lately – well maybe not that lately, more like for quite a while now – I’ve been cooking with beer trying to keep up with the ever so popular and trendy Nordic cuisine trend. I’ve baked, stewed and tried to sneak in a little beer where ever I saw fit. A month or so, I ventured into beer ice-cream, or to be more precise: Vanilla ice-cream with a little beer added at the end for flavor and that touch of Nordic’ness, that seems so right, these days. And was it nice? Indeed! In stead of using a porter, as the recipe called for (I turned to everpresent Claus Meyer, for Danish speakers, check out his homepage for the original recipe), I used a stronger, darker and umpf’er imperial stout from the magnificent Norwegian brewery, Nøgne Ø. The result was great, but I thought it could be better. I wanted to stress the caramel tones and hints of dark, unrefined sugar. Making a beer-pear syrup did the trick. Pears are pretty much over and out this time a year, but if you’re lucky enough, like me, to get your hand on a couple Doyenne de Comice. Don’t you hesitate – slice ’em up and bath them in beer! By the way, this is not the place to cut down on sugar, cream or egg yolks. They all need to be there to balance out the bitterness of the beer. Peel and pit a couple of pears, then slice then into 1-2 cm slices. Meanwhile heat half a bottle of dark beer (I used Nøgne Ø’s Imperial Stout) with 150 ml moscovado sugar and 50 ml of ordinary light cane sugar. (Using two kinds of sugar provides you the zing of ordinary sugar and the deep, dark aromas of moscovado; please note, that different beers might need different amounts of sugar.) When the mixture is boiling, add the pears and simmer gently until cooked. They don’t take long, and you don’t want mush but texture. Remove the pears and reduce the liquid into a syrup. Beat the egg yolks and sugar until the sugar has dissolved. In a small saucepan combine milk, cream and the pod and seeds of the vanilla and bring to the boil. Discard the pod and slowly and while whisking, pour the mixture over the eggs. Return to the saucepan and gently (VERY gently!) simmer until it thickens. Using a thermometer might do your nerves a world of good: when it reads 84 C pour the mixture into another bowl to stop it cooking. Let the cream cool in the fridge and add as much of the syrup as you like. Start out with 50ml or so. Churn the mixture in an ice-cream maker and enjoy on a windy, cold night. Luckily, they are almost outnumbered now, but better to be on the safe side and keep a little ice-cream in the fridge. Besides, it isn’t bad in sunshine either. I made the pie from the last apple quinces I could get my hands on. Yes, I know, I’ve been babbling on and on about quinces ever since I started this blog, but I just can’t help it. Really, I try – and then there they are again, ideas bumping around in my head of what to do with these fruits of magic. There is just something elusive and magical about them, that keeps on stirring my interest. Maybe it’s the way they are unapproachable when uncooked, maybe their sweet apple-like aromas? Quinces take quite a while cooking and a lot of sugar, too. I made the pie partly from a recipe, partly on the spur of the moment. First, I made a quince compote. That took a while. And then a while longer. Actually, so long, that I had to stop cooking and continue the day after. So if you plan to do this, make sure you have at least three hours on hand. The idea is the following: Wash the quinces (for a 24 cm pan 3 if using apple quinces, half as much if using regular) and remove the pit. Dice into 3 cm cubes and put into a pot and cover with water, two handfulls of sugar or so. Now, decide on what kind of spice you want to use. I recommend vanilla and lemon zest – both is great with quinces. Cinnamon is another, but after Christmas, you might have had enough. I know I have. Lemon zest is essential, I think, as the fruits need a little acidity. Cook the quinces slowly until reaching a compote like consistency. It might take a while, as I mentioned. The pieces should retain their shape, you’re not making mash here. When happy with the compote, drain completely. Keep the liquid, it’s great on yoghurt or other places where you use sweet sirups. Meanwhile, make the pie dough and refrigerate. You probably have your own favorite recipe for that, so I won’t bother. I didn’t prebake the pie, lazy me… – and the world didn’t come to a stop and the pie was great. So up to you. Fill the pastry shell with the compote and slice up a couple of apples very finely, discarding the pit, and cover the pie. Bake for 30 min. or so at 180 C until nice and golden. Serve with a little whipped cream and maybe a drizzle of the left over sirup. Tea is nice, too. Not fruity but black, Ceylon would be my choice. This is a Danish classic. Found in every baker throughout the country. Usually, though, made with margarine and other absurdities. These however are the real deal! Made with butter, crispy and light and with the twang of good, homemade raspberry jam. I found them at a little cafe downtown, not the other day… We’ve been there more than a few times. It just couldn’t go on, I guess. Nope. It had to end sometime. A couple of weeks ago, I started being part of the morning rush hour again, catching the bus out to the outskirts of town. Back to work after a couple of months on paternity leave. Getting back to work hasn’t been all bad, but it sure has cut down on my cooking ambitions, no cooking all day these days. One (very) good thing, though – and food related – is that I go to Copenhagen once in a while, attending meetings and that sort of thing. Those meetings aren’t the good, food related things, especially not the parts of the public administration I visit. Their food skills really aren’t worth writing home about. Actually, not at all. But, sometimes I have a little extra time, giving me the chance to visit some more interesting places in our lovely capital (Read more on Copenhagen and foodie related stuff at Bea’s who just visited the place, took some great pictures and met up with fellow Danish food blogger Zarah.) One of the places I go back to often is Meyer’s Deli. They have an outlet at Magasin and even though I like the original on Gl. Kongevej better, the one in Magasin does the trick and gives me my occasional Meyer fix. This time around I opted for a cabbage soup with puy lentils. It was a great lunch dish with crunch from the fresh green cabbage garnish and the lightly cured goose providing the filling. I assume this was made from simmering a lightly cured goose in a stock, removing the goose when done and cooking the cabbage in the stock afterwards. The stock and cooked cabbage was then pureed and seasoned, the plucked meat of the goose added, and then served with finely chopped, fresh cabbage and cooked puy lentils. Serve with bread on the side. For dinner I went to the Deli on Gl. Kongevej. You might say I have a slight obsession for Claus Meyer’s books and deli’s – and you’d probably be right. Yes, I’m sure they make decent chocolate in Paris. I’ve heard they even make some in the US. And of course Valrhona isn’t a bad choice, but really when it comes down to serious business, there really is only one. Well, in my humble opinion anyways. Jokes aside, there are tons of great chocolatiers around, and we’re lucky enough to have a couple close at hand. Summerbird is our absolute favorite with their innovative twist on the chocolate side of life. It’s never over the top but always a little different than those mainstream products you pick at the gas station because you forgot the gift for grand ma. 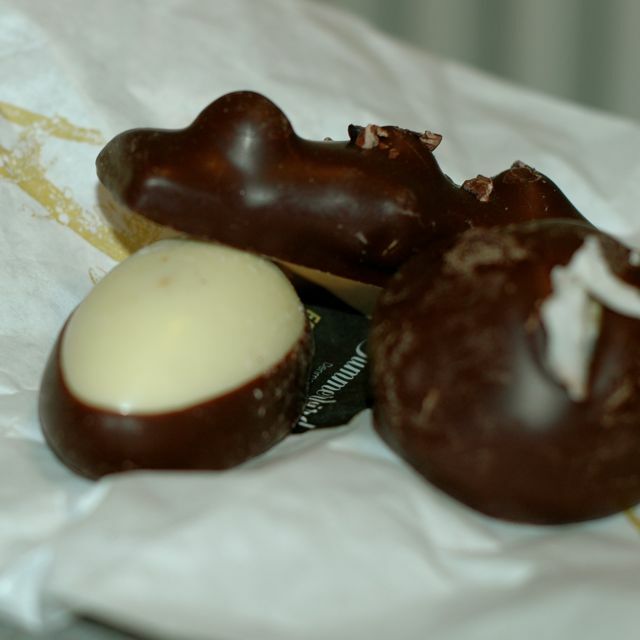 The star of the trio above is the egg covered in white chocolate. The inspiration is the spices of the Middle Ages, it may sound a bit strange but any reservation will be put to instant shame by this complex chocolate ganache filled baby – try one!